Out of all the DCEU releases thus far, Aquaman has surely had the biggest brunt to bear upon its release. Not only did it need to distance itself from the atrocity known as Justice League, but it also had to prove why the character of Aquaman – along with the DCEU as a whole – are worthy of their place on the silver screen. Truth be told, Aquaman is the type of character who is really hard to nail in live-action. There are a number reasons why it’s taken so long for this character to get his cinematic due. However, there’s an inherent silliness to Aquaman that is a product of the time in which he was created. He’s also been haphazardly handled throughout the years. 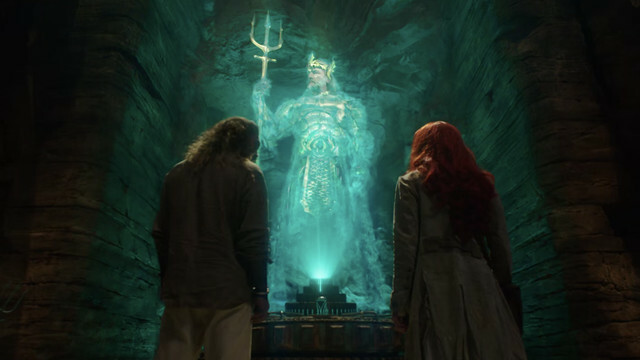 Although the technology has certainly caught up to the premise, there’s simply so much baggage with his history that it makes an Aquaman film a tough sell for general audiences. Luckily, the filmmakers understood the importance of the eponymous hero – making a rushed, but strong case for why Aquaman should be respected and revered. The story takes its cues from the New 52 origin of Aquaman, which attempted to legitimize the hero in the same way that the movie does. Even though the film is a slightly more convoluted version of the aforementioned comic story, it’s largely successful in bringing a solid, albeit overstuffed version of the character’s origin to life. 75% of the reason why Aquaman works as well as it does is because of the film’s director, James Wan. Starting with Saw, Wan has proven time and time again that he’s a master of telling effective, memorable genre stories. 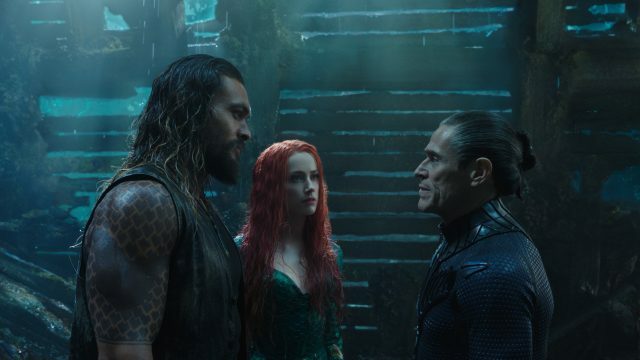 Although Aquaman marks Wan’s first foray into the world of comic book movies, it’s clear from the start that the director has a deep affection for the character as well as the medium as a whole. Wan brings a near-reverential love for Aquaman that permeates through every frame of this movie. As a result, Wan has created a well-crafted film that is ultimately hampered by its sub-par writing. Tonally speaking, the movie rides a fine line between the seriousness that that the DCEU has become so well known for, while also offering a certain sense of playfulness that the franchise has been sorely missing up to this point. Aquaman is the type of movie that takes itself just seriously enough that it never becomes completely laughable. At the same time, it’s also a movie that embraces the aforementioned silliness of the character. As a result, the tone of the film often flip-flops, even during the same scene. This sometimes makes for a jarring experience. However, it’s also clear that Wan simply understands the character, both on an emotional and a literal level. The other 25% of why Aquaman works is because of Jason Momoa’s magnetic screen presence. Coming off of the character’s introduction in Justice League, it was hard to believe that Momoa or Zack Snyder truly understood Aquaman. From the start of his first solo outing, it’s immediately clear that Momoa does in fact get the character. Even though his interpretation is an amalgam of a few comic versions, Momoa manages to inject elements of his own personality into Aquaman. Somehow, this makes Aquaman even more relatable and extremely charismatic. Most of all, Momoa seems to be having the time of his life, which is something that the movie badly needed. Since he was cast in the role, Momoa has been on a five-year journey to get this film made. It’s fairly apparent that Momoa is making the most of his time in the spotlight, culminating in what will surely become the definitive version of Aquaman moving forward. While Nicole Kidman and Temuera Morrison are also highlights, the chemistry between the rest of the cast and Momoa is middling at best. Amber Heard, Willem Dafoe, Patrick Wilson, and Dolph Lundgren are all inspired casting choices on paper. However, they somehow seem to be in a slightly different movie than the lead. While the writing is certainly a factor there, the chemistry between Heard and Momoa never quite clicks between the two, making certain moments in their relationship feel rushed. Despite having a solid story and structure, the actual execution of the screenplay is flawed on a fundamental level. Written by David Leslie Johnson-McGodrick and Will Beal, the script often feels ham-fisted and convoluted. Moreover, the story also makes too many assumptions about the knowledge of casual fans watching this film. While it’s never good to over explain how this universe operates, the world building is nearly non-existent. When there is world building, it comes in the form of clunky dialogue and exposition. The individual scenes themselves are compelling enough, but there’s often a lack of dramatic action that fails to connect the film’s sequences. This is especially problematic when it brings the forward momentum of the plot screeching to a halt. In other words, the movie jumps from moment to moment with no clear throughline of how these sequences connect to a larger theme. This becomes most apparent in the third act, when the action jumps from place to place with hardly any spatial awareness between the characters. Throughout most of the film, Wan does a wonderful job of creating a sense of geography, especially within the action scenes. However, the climax of the movie devolves into a mess of visual effects, as the film loses any sense of restraint that it once had. A common problem in all of the DCEU releases is that they seem to have trouble sticking the landing. 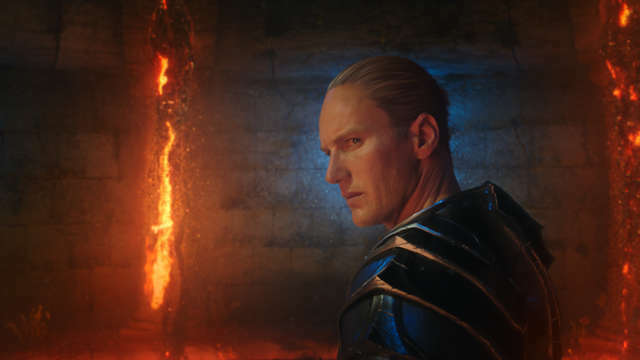 By the end of Aquaman, it’s never really quite clear how the story reached that conclusion, even though the titular hero’s transformation largely worked. It’s ultimately a much more satisfying and exciting conclusion than it has any right to be, even though the road to that point was a bit rocky. While some have already called this movie an underwater version of Star Wars, it’s actually closer to Tron: Legacy. 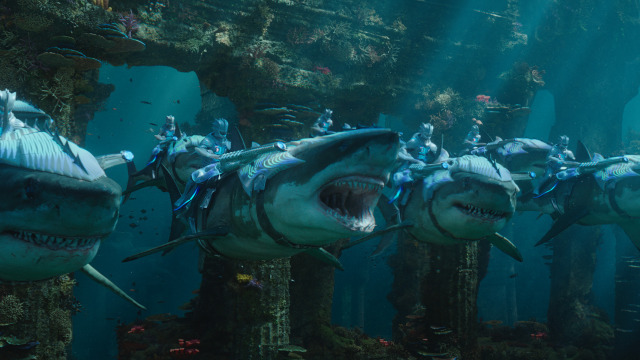 In terms of Aquaman’s visual aesthetic, Wan seems extremely interested in creating moments that feel like living representations of comic book frames. They’re bright and colorful, while using specific color framing to achieve the desired effect. 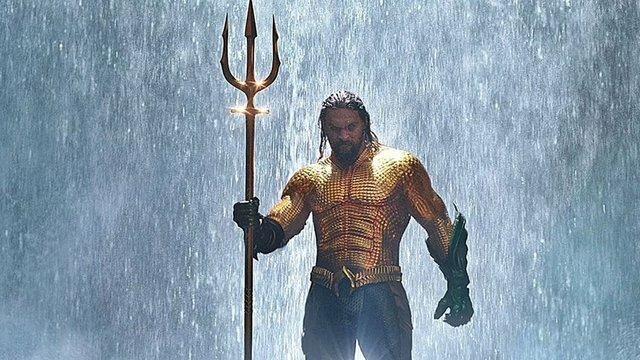 The reveal of the classic Aquaman suit is easily the pinnacle of the film’s effectiveness. It’s an instantly iconic moment, which creates an impactful image that is emblematic of a splash page perfectly translated to the screen. 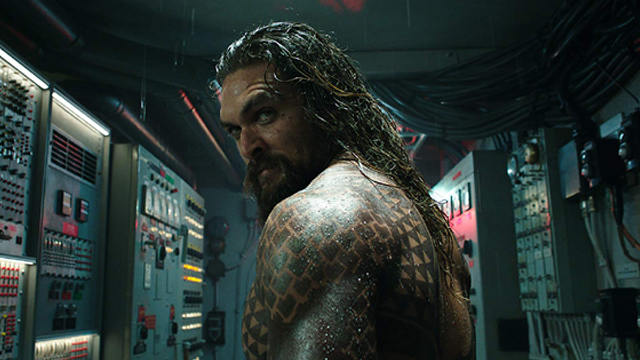 Although Aquaman employs a great deal of practical costuming and techniques – such as dry for wet – the effects completely fall apart when it goes into full CG-mode. Even though the underwater sequences often tread into this territory, there’s no doubt that Aquaman won’t age well from an effects standpoint. Underwater effects have always been hard to accomplish, especially when it comes to digitally recreating human characters. Wan has always been a restrained filmmaker, but having the ability to do anything with these characters in a digital space makes the movie feel like Michael Bay directed all of the underwater action. This capricious approach to the entirely digital sequences gave Wan the freedom to move the camera in visually dynamic ways. In turn, this makes the CG sequences feel like a different directorial approach altogether – one that feels wildly inconsistent when compared to the more grounded, practical action. Although Wonder Woman is an objectively better film overall, there’s something about the playfulness of Aquaman that lends itself to being a fun, albeit flawed viewing experience. It’s easy to be of two minds when thinking about this film. On one hand, it’s an enjoyable ride that has just enough characterization and directorial flair to make its existence feel warranted and appreciated. On the other, it’s often haphazardly plotted, while trying to stuff too many narrative threads into what is supposed to be an origin story about the eponymous character. Sometimes it feels like Aquaman is more concerned with setting up sequels than telling a great story, which is a larger problem among the DCEU entries as a whole. While Aquaman is far from perfect, it is easily the most enjoyable DCEU film to date in terms of pure fun. On a larger level, it’s hard to say that the movie has necessarily saved the DCEU single-handedly – because it hasn’t. But it has succeeded in providing some much needed gusto to a franchise that was basically on life support. More importantly, Aquaman proves that the DCEU has a place for stylistic filmmakers like Wan. The DCEU needs directors who can elevate the material while offering their singular, unique vision. It’s very important for the DC films to diversify the behind the camera talent that are making these movies. Fortunately, Aquaman is unequivocally a step in the right direction. Tags: Aquaman, DC Extended Universe, james wan, warner bros.